Gov. Rick Scott said Florida won't take more Syrian refugees without "an extensive evaluation of the risk these individuals may pose to our national security." Scott said "the news that at least one of the terror attack suspects gained access to France by posing as a Syrian refugee" has led Florida to reevaluate its resettling plan, citing homeland security concerns. 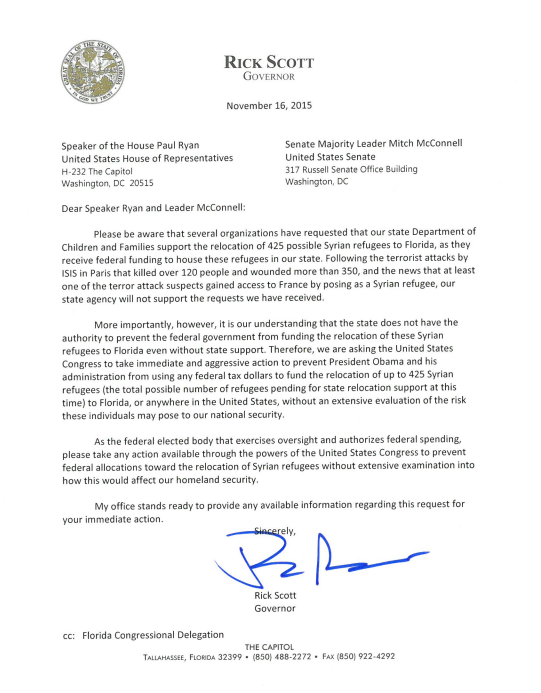 Instead, Scott is asking Congress to block President Obama from using federal tax dollars to relocate Syrians without "an extensive evaluation of the risk these individuals may pose to our national security." Florida is one of six states that has housed the majority of the 1,500 Syrian refugees that have entered the country in the last four years, along with Texas, California, Michigan, Illinois and Arizona. About 3,000 Syrians live in South Florida. Former Florida Gov. Jeb Bush, who is running for president, said Sunday that U.S. aid should focus on Christians fleeing persecution in Syria. "I think we need to do thorough screening and take in a limited number," Bush said while appearing on the CNN "State of the Union" show. "There are a lot of Christians in Syria that have no place now. They'll be either executed or imprisoned, either by (President Bashar al-Assad) or by ISIS. We should focus our efforts as it relates to the refugees for the Christians that are being slaughtered." Presidential hopeful and U.S. Sen. Marco Rubio said on ABC's "This Week with George Stephanopoulos" that the U.S. "won't be able to take more refugees." "It's not that we don't want to," Rubio said. "It's that we can't." As of Monday, Michigan, Alabama, Texas, Arkansas, Louisiana, Indiana, Illinois, Massachusetts, Arizona, North Carolina and Mississippi had also announced they are at least temporarily refusing to take in Syrian refugees. The White House says it plans to go forward with its policy of accepting 10,000 Syrian refugees by 2016. How Many Of Syria's Refugees Are Coming To South Florida? The more than 4-year-old civil war in Syria has triggered what the United Nations is calling the biggest humanitarian crisis of our time. About four million Syrians have been forced to flee their homeland as refugees. And in the last four years, about 1,500 have been relocated to the United States. According to the State Department, the six states that have housed the most Syrian refugees so far are Texas, California, Michigan, Illinois, Arizona and Florida. Should The U.S. Intervene In Syria? In the wake of a chemical weapons attack that reportedly left more than 1,400 Syrians dead , the debate has begun on whether the U.S. should intervene. The American people now wait for what steps, if any, the United States will take in the coming weeks. The Takeaway has responded to this call for a national conversation with special programming. The Takeaway's John Hockenberry hosted a live chat dedicated to the unfolding crisis in the Middle East as America focuses on possible next steps for action in Syria. In the aftermath of the deadly terrorist attacks in Paris, the French consul held a vigil in Brickell on Saturday. Roughly 40 people gathered at the consulate with candles and flowers to mourn those killed during Friday’s attacks. Shock and deep sadness permeated the scene.